Montana Fish, Wildlife and Parks’ biologists have confirmed a grizzly bear sighting on a ranch in the northern Big Belt Mountains. The sighting is the second in the Big Belts this summer and is likely two separate bears. The first sighting was 3-year subadult male northwest of White Sulphur Springs, confirmed through photos taken by FWP trail cameras. The second sighting was confirmed from a video of the bear on private land in the area between the Missouri River and Hound Creek, south of Cascade. The bear also is a subadult male. Grand Teton National Park rangers conducted a helicopter-based rescue of a climber who was seriously injured while descending the Grand Teton. The rescue effort began at 4:16 p.m. Friday, August 19 when rangers received a call from a member of the injured climber’s party. Evan Pack, 33, of Lehi, UT summited the Grand Teton and was beginning to descend the mountain when he lost his footing on a downclimb and fell approximately 20 feet. He suffered serious injuries requiring evacuation from near 13,770 foot summit. As Teton Interagency Dispatch Center received the initial call for help, the Teton Interagency Contract Helicopter was headed to Yellowstone National Park to assist an injured hiker on Avalanche Peak. Once that hiker was flown to safety, the helicopter returned to Grand Teton National Park and deposited two rangers who were on-board at the Lower Saddle below the Grand Teton. Once configured for short-haul, the helicopter returned to the Lower Saddle and flew the rangers to the location of the accident. The rangers provided emergency medical assistance, prepared Pack for the short-haul flight, and loaded him into a rescue litter. One ranger then flew with Pack to the Lupine Meadows Rescue Cache at 7:04 p.m. Pack was transferred to an Air Idaho Rescue helicopter and flown to the Eastern Idaho Regional Medical Center in Idaho Falls, ID. The other ranger assisted the remaining four members of Pack’s party with the descent from the Grand Teton to the Lower Saddle. Grand Teton National Park will experience a Total Solar Eclipse on Monday, August 21. The backcountry will remain open to climbers and hikers, though many areas are expected to see increased visitation. Rescue resources will be extremely limited, so appropriate skill level relevant to the climb or hike is essential to visitors’ safety. Overnight backcountry permits have all been distributed through the eclipse. Visitors must have a permit to spend the night in the backcountry of Grand Teton National Park. Grand Teton National Park’s Jenny Lake Rangers, Teton Interagency Helitack, and the Teton Interagency Contract Helicopter came to the rescue of two mountaineers Tuesday, August 15. The mountaineers, Nick Marucci, 30, of Salt Lake City, UT and Laura Robertson, 23, of Orem, UT were attempting to complete the Grand Traverse when they became mentally and physically exhausted after five challenging days in the high mountains. After discussing options with the climbers to make the long descent out of the mountains Tuesday morning, it became clear that they were too exhausted and an aerial rescue would be the safest and most expeditious form of rescue. Rangers conducted a reconnaissance flight before configuring the helicopter for short-haul rescue. Once an adequate window between mid-level clouds opened, one ranger was flown to the climbers’ location at 12,600 feet and he prepared the two climbers for extraction by short-haul. Just after noon, Robertson was flown solo to the Lupine Meadows Rescue Cache in an evacuation suit before the ranger flew with Marucci to the same location a few minutes later. Jenny Lake Rangers advise mountaineers attempting the Grand Traverse to become familiar with portions of the route’s complex terrain before attempting the route in its entirety. Special attention should be given to possible escape routes along the way. Additionally, cool temperatures and precipitation can come to the Teton highcountry with little warning—adequate rain gear is essential. Grand Teton National Park managers expect August 21, 2017—the day of the Total Solar Eclipse Across America—to be the busiest single day in the history of the park. Visitors to the park on eclipse day can ensure a successful viewing experience by developing a plan and heeding a few simple guidelines. Complete eclipse viewing information can be found in a special edition newspaper available in park visitor centers and entrance stations, and by visiting www.nps.gov/grandteton and clicking the eclipse banner. •Additional portable toilets will be located throughout the park. Several special eclipse and astronomy programs are planned in the park this weekend, Friday, August 18 through Sunday, August 20. Please visit the park’s website or the special eclipse newspaper for more information. Stage 1 fire restrictions will be go into effect for Bridger-Teton National Forest, Grand Teton National Park, Bureau of Land Management High Desert District and National Elk Refuge beginning 12:01 a.m. Tuesday, August 15. Fire managers study the moisture content of various fuel types, track current and expected weather conditions, and monitor available fire-fighting resources, as well as the occurrence of human-caused fires, to determine when fire restrictions need to be applied to public lands. The Teton Interagency Dispatch Center has recorded over 73 unattended campfires so far this summer. Teton and Sublette Counties will also begin fire restrictions this week. The Shoshone and Caribou-Targhee National Forests have implemented some form of fire restrictions as well. Teton Wilderness on the Blackrock Ranger District, and the Bridger Wilderness on the Pinedale Ranger District of the Bridger-Teton National Forest, will be exempted from the stage 1 restriction order. These areas are higher in elevation and the fuels are not as dry as the rest of the forest. •Lighting, building, maintaining, attending or using a fire, campfire, barbecue or grill is allowed only at designated recreation sites such as established campgrounds or picnic areas. Use of portable stoves and lanterns using gas, jellied petroleum or pressurized liquid fuel, or use of a fully enclosed sheepherder type stove with a spark arrester screen is permitted. •Smoking is allowed only in an enclosed vehicle, building (unless otherwise prohibited), developed recreation site, or while in an area at least three feet in diameter that is barren or cleared of all flammable materials (i.e. parking lots, developed campsites, or locations surrounded by water). •Operating a chainsaw is prohibited in national parks and on the wildlife refuge. Operating a chainsaw on national forest lands is permitted only when equipped with a USDA or SAE approved spark arrester that is properly installed and in effective working order. Operators must also carry a chemical pressurized fire extinguisher with a minimum rating of 2A and one round point shovel with an overall length of at least 36 inches. •Discharge of fireworks and use of explosives requiring blasting caps are prohibited. •Charcoal burning fires are only allowed in official campgrounds and picnic areas. •Stoves and grills that burn contained fuel sources that can be turned off and on are allowed. Stoves and grills must be attended to all times and be setup on hardened surfaces devoid of vegetation at least three feet in diameter. Unattended or abandoned campfires can quickly escalate into wildfires, and it is extremely important that all campfires are completely extinguished and cold to the touch before campers leave their site. Visitors should NEVER leave a fire unattended, and should prepare for the unexpected by having a water bucket and shovel on hand and ready to use. The fine for an abandoned campfire as well as campfires in unapproved areas is up to $5000 or 6-months in jail, but campers can also be held liable for suppression costs if their campfire becomes a wildfire. A copy of the order and additional information on allowable stoves is available on www.tetonfires.com. To report a fire or smoke on the Bridger-Teton National Forest, Grand Teton National Park, or National Elk Refuge, call 307.739.3630. Glacier National Park has resumed issuing backcountry permits in designated backcountry sites. Some backcountry campgrounds are closed due to fire activity. All front country campgrounds remain open. Check https://www.nps.gov/glac/planyourvisit/hikingthetrails.htm for updated status. 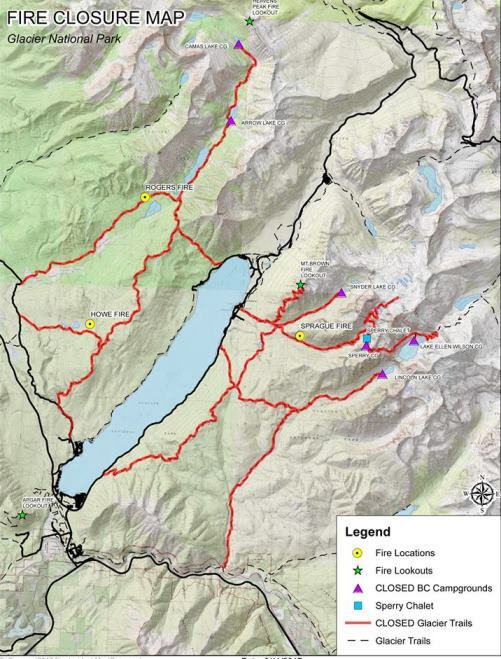 Trail closures remain in effect for the Howe Ridge Trail, Camas Trail, Trout Lake Trail, the Gunsight Pass Trail from Lake McDonald to Gunsight Pass (including all secondary trails such as the Snyder Lake Trail), and the Lincoln Lake Trail. The Sprague Fire (estimated at 35 acres) is being managed using a confine and contain strategy due to the steep terrain and concerns with fire fighter safety. 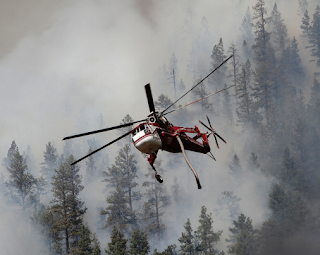 Aerial resources have been used to slow fire growth, and ground resources are on scene. Other fires within the park are being staffed. Sperry Chalet remains closed. The structures in the Sperry Chalet complex are not immediately threatened, however the Sprague fire has necessitated the closure of the main trail that accesses the chalet. No overnight guests remain at Sperry Chalet. Three fires were confirmed following yesterday afternoon's storm. The following trails are still closed: Apgar Lookout Trail, Howe Ridge Trail, Camas Trail, Trout Lake Trail, the Sperry Trail from Lake McDonald to Sperry Chalet (including all secondary trails such as Synder Trail), John’s Lake Trail, and Lincoln Lake Trail.